I’ve been talking a lot here about how much I love teaching at the Magical Fiber Fantasy Retreat in November in Disney World with The Ross Farm and Four Purls! One of the things I do for the students is to introduce new Disney-themed designs and build my classes around them using all sorts of exciting techniques. 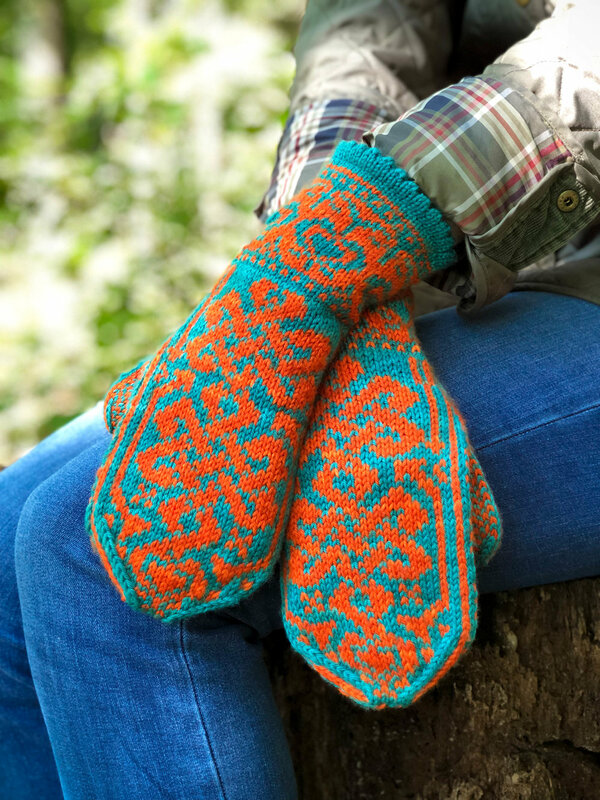 Nothing gets you in the mood for a magical retreat than new magical designs to knit! Over the past couple of weeks I’ve shared the Elsa Cuffs, the Heirloom Braid Cowl, and the Briar Rose Cowl. 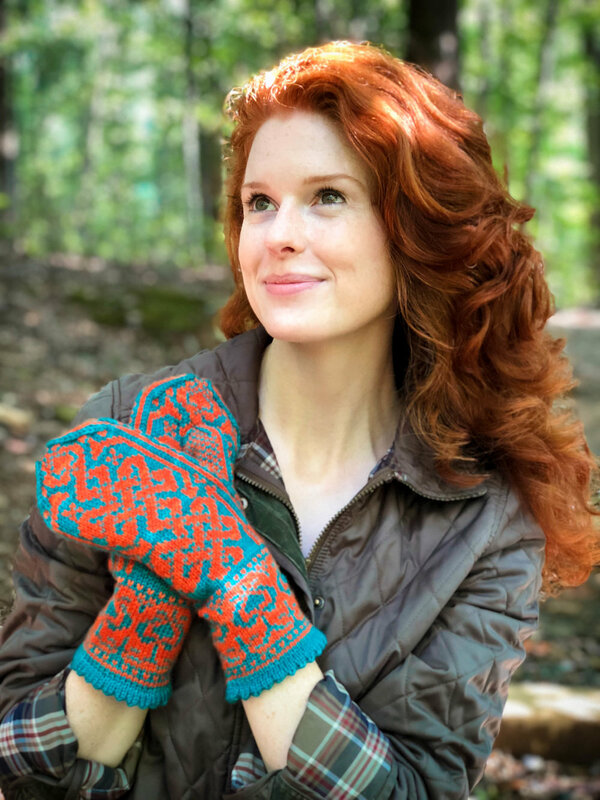 Today I’m happy to finally get my favorite from this retreat out there and available to all - the Merida Mittens. Merida is my one of my favorite Disney princesses from the movie Brave. She’s a bit rough around the edges, a tomboy, shuns her princess status and balks at the thought of marrying. She rides horses, shoots arrows, climbs mountains, chases will-o-the-wisps through the Scottish forest, attempts to wrangle her little brothers, and is struggling with leaving her childhood behind and growing up. She has fiery orange hair and wears a deep teal dress. This isn’t my first Brave-inspired design. Back in 2015 I introduced the Chase the Wind & Touch the Sky beaded lace shawl, inspired by my favorite song from the movie. This is one of the Disney films that didn’t get the attention it deserved and has a strong and willful female lead. If you haven’t seen it, get your hands on the DVD! 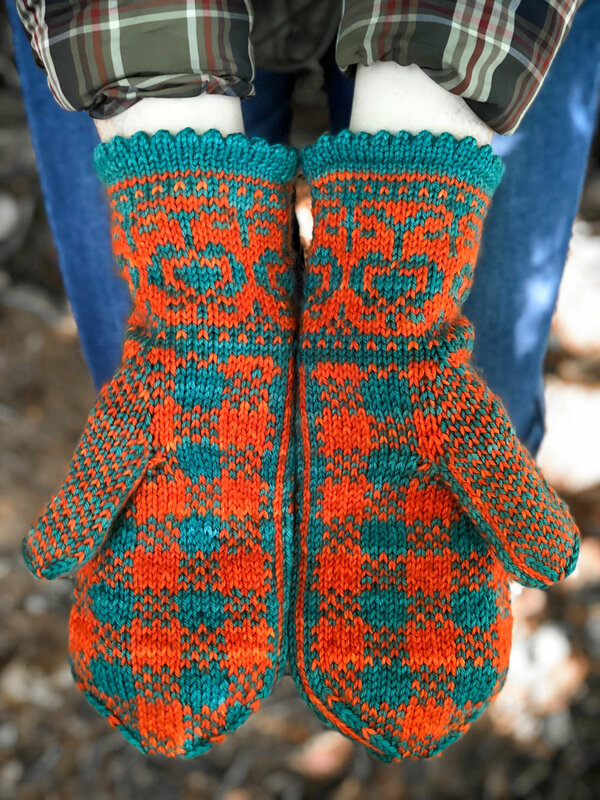 With Merida and her firecracker personality in mind, I set about designing these mitts, working closely with Queen City Yarn to have the perfect orange and teal yarn to work with in their Biddleville DK. I knew I wanted a picot edging as a nod to her struggles with femininity, Scottish thistles in the cuffs, Celtic cables twisting their way up the front, and Scottish tartan on the palm side. That may be my favorite element - a tartan surprise in the palm of your hand! This design was tricky with so many elements and I worked and reworked the charts dozens of times until it clicked. It also gave me an excuse to watch the film again with my son and get one of my models with gorgeous natural red hair on standby. Knit from the bottom up in the round on 2 circular needles (DPNs or magic loop can be substituted if preferred) using stranded color work on DK weight, these mittens have traditional Nordic shaping and a thumb gusset. It was fun trying them on as I was knitting them and watching them come to life on my hands. I LOVE THESE MITTENS. I love everything about them and am delighted at how they turned out. It was wonderful to see the sold out class packed with Fair Isle knitters, all working in different color combinations and talking about the film! Let’s give away a copy of the pattern! Answer the below Brave trivia question correctly and you’ll automatically be entered to win. Be sure to leave your Ravelry name in the comments and I’ll gift the pattern to you directly. A winner will be chosen at random on Friday, November 30th. What are the names of Merida’s mischievous triplet brothers? 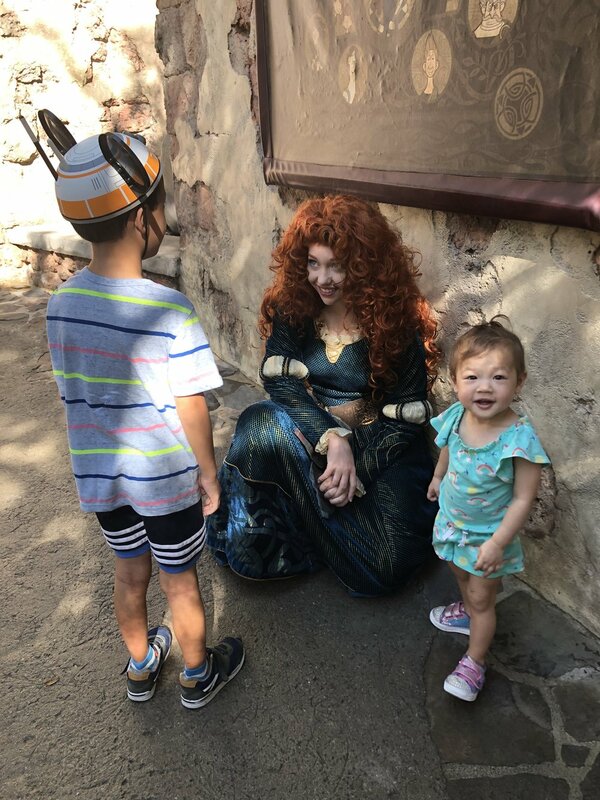 Download the Merida Mittens pattern here, purchase a kit from Queen City here, and enjoy the picture below of my kids meeting Merida in Disney World!